Six months ago, Northern Parrots thought they had done everything possible to improve their website. As the leading UK retailer of food, toys and accessories for parrots with a seven digit annual turnover, they were already getting outstanding results thanks to e-commerce best practice and expert recommendations. They had even been told by a number of experts that the homepage was so good it couldn’t be bettered. Could Conversion Rate Optimisation really make that much difference? But then he spoke to AWA digital who were confident they could lift Northern Parrots' web sales by 20% or more. Initial scepticism quickly transformed into temptation as they realised they had nothing to lose. AWA even offered to to refund all their fees if they didn't hit the target. It really was a win-win situation. Six months later, and Northern Parrots are looking at sales increases of 34.7% from just one split test. Remarkable considering their conversion rate was already well above industry average. This outstanding result, and the process used to achieve it, are the reason this test scooped Gold in the Best Home Page category of the 2014 WhichTestWon awards. Read this conversion rate optimisation case study to find out how the AWA Conversion System™ was used to gain this uplift and smash their end of year sales target. The key to achieving double digit results is talking to and understanding your customers. All our tests show that this is vital to make meaningful improvements. Analytics data, best practice and expert reviews can only take you so far. There were very few clicks on the main area of the homepage, despite this being where they majority of the promotions were. The majority of clicks were in fact on the side navigation which listed product categories. This heat and scroll map data from over 1,700 visits was the first indication of the browsing behavior of Northern Parrot’s customers. 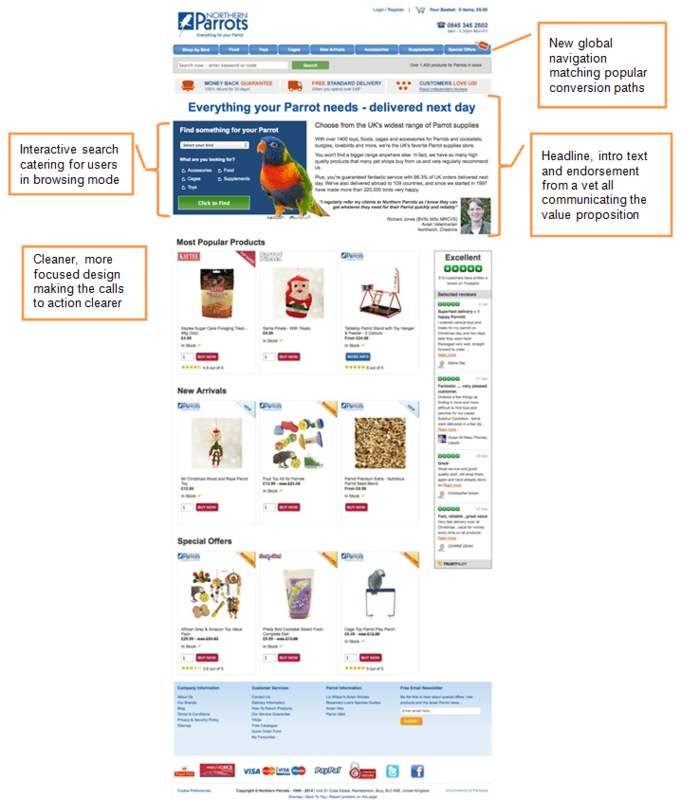 Customers wanted to discover new, tempting items rather than search for specific items but the side navigation didn’t meet these browsing needs. Visitors wanted it to be clearer and more suited to their habits. These findings from user testing with five Northern Parrots’ customers provided a new perspective on the heat map data and shows the importance of understanding your customers’ needs, not just their clicking behaviours. Visitors’ were happy to share their fears, concerns and pain points in user surveys. Respondents also told us what they loved about the website and why they chose this one over the competition. There was no clearly identified value proposition explaining why a prospect should buy from Northern Parrots as opposed to a competitor. Using the responses from the user survey, we were able to clearly identify the main reasons Northern Parrots’ customers were buying and use these to convey the value proposition in our design variation. After gaining insight from Northern Parrots’ customers and visitors, the next stage was to turn this wealth of data into a clear optimisation plan. To do this, we recorded each unique insight, the impact and the quantity and type of evidence supporting it. This unique Triage™ analysis enabled us to easily identify the best opportunities on the website and create a prioritized optimisation plan. This is a great example of the importance of gathering voice-of-customer data in your CRO project. Traditional conversion funnel analysis and recommendations from experts had led the client to believe that the homepage was performing well and there would be little opportunity to deliver such bold uplifts on this page. However, our voice-of-customer evidence suggested otherwise. Our team could see that this was definitely the page to focus on for his first split test and it was the first test proposed in the optimisation plan. To test these hypotheses, the team created a wireframe of the page we believed would better meet visitors’ needs and increase sales. De-cluttering the design, re-writing the key content on the page and catering for the browsers were all high on the agenda. Another innovation was incorporating an endorsement from a vet because user feedback showed was the main reason customers chose this site over the competition. Our optimisation team then worked collaboratively with our copywriting and creative teams to refine the wireframe and content. The optimisation team went back to the user testers they had previously worked with and got their feedback on the wireframe. Their feedback was fed into the final design which was tested. This collaborative approach to creative execution together with the deep-dive research meant we were confident that our variation had the best chance of delivering double-digit increases. The experiment ran for a total of three weeks. During this time our variation consistently outperformed the control. 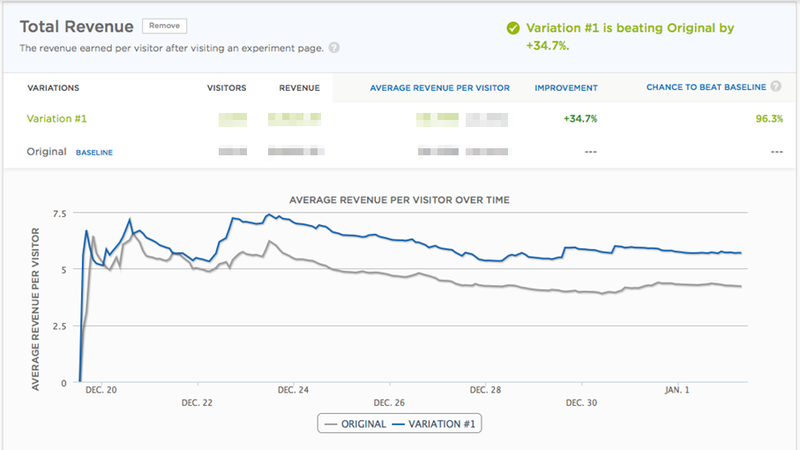 The final results of the experiment were a site-wide increase in revenue per visitor of 21.7% at a 95.1% confidence level. That meant our 20% uplift guarantee had been conquered in the first split test alone. But the really interesting bit was when mobile traffic was excluded. For these non-mobile users (who make up the majority of Northern Parrot’s visitors), the increase in revenue per visitor rose to 34.7% at 96.3% confidence level. This was an interesting finding in itself. Why were mobile users less responsive? We developed two hypotheses for this. Unlike non-mobile visitors the majority of Northern Parrots’ mobile users are ‘buyers’, not ‘browsers’. In order to test these, we have updated the optimisation plan with a mobile-only homepage test. Always looking for the next big win, our optimisation team are already working on beating this result with their next test on the category pages of the Northern Parrots website. We also plan to re-visit this homepage test once it has been developed to see what additional uplift potential there is. As well as smashing the AWA guarantee, this test also beat off 136 other entrants from all over the world by scooping Gold for Best Home Page in the WhichTestWon 2014 Online Testing Awards.